But gardeners who have been in their house for a few decades insist they were there before the deer. While many people think that we are encroaching on the deer’s long-established habitat when we build new developments, suburban sprawl is actually creating refuges for deer, said Paul D. Curtis, associate professor and extension wildlife specialist at Cornell University. Let’s go back about 100 years. In the early 1900s, there were no deer in Western New York. Curtis told me in a telephone interview that 95 percent of the landscape had been cleared of timber for agriculture, so there was no woodland cover for deer to hide in. Deer, along with other animals such as turkeys and bear, were eliminated. In the 1920s, the state and federal government recognized this as a problem. For the first time, game laws were enacted to put some limits on hunting. In the 1930s, some farms were abandoned. Trees grew and the landscape was changing into habitat that favored deer. What was once farmland is today 70-to-100-year-old forest. But the deer didn’t wander into Western New York on their own. The Department of Environmental Conservation began to bring deer here in the 1930s and ’40s, Curtis said. In the 1950s, deer hunting was opened up, but for bucks only, he said. Officials wanted to protect female deer in order to keep increasing the deer population. By the 1970s and ’80s, there were enough deer that hunters could take does. The rules on hunting female deer are still liberal because we have so many deer now. The number of deer continues to rise and it has become a problem in the last couple of decades, he said. “The reason is suburban sprawl,” Curtis said. Deer don’t come into our gardens because we’re encroaching on deer habitat or taking away their habitat, it’s because we’re creating what he calls deer refuges. Patches of woodland near houses or other developed areas provide cover for deer. I’ve seen deer along Main Street in the City of Buffalo, near Canisius College — which is close to Forest Lawn cemetery. I’ve seen deer nibbling on shrubbery in the front yard of a home in South Buffalo– which is near South Park. As I was talking to a gardener in Cheektowaga last year, a deer walked into the neighbor’s yard– There is a woodsy vacant lot behind the yard, a creek runs nearby and Stiglmeier Park is just down the street. But the way we’ve changed the landscape gets even better for the deer. We plant ornamental shrubs and lots of other plants that appeal to them. These plants are well fertilized, healthy and nutritious. “Deer can live better in suburbia than in the woods,” he said. Curtis has seen deer bedding next to houses because the houses provide them with thermal protection. The walls provide a windbreak and there may be heat coming off the house. “It’s the ideal deer habitat,” he said. A couple more factors make urban and suburban areas great habitat for deer: There are few natural predators and hunting is prohibited. Many of us think of deer as creatures that flourish in rural areas, but the numbers of deer in rural areas are held in check because there is more access to hunting, Curtis said. You can’t discharge a firearm within 500 feet of a house or occupied structure, so any developed areas are off limits. Having just one house in an area means 18 acres of land are off limits to hunting. We’ve had some mild winters recently, and that has also helped to keep the numbers of deer high in Western New York, he said. 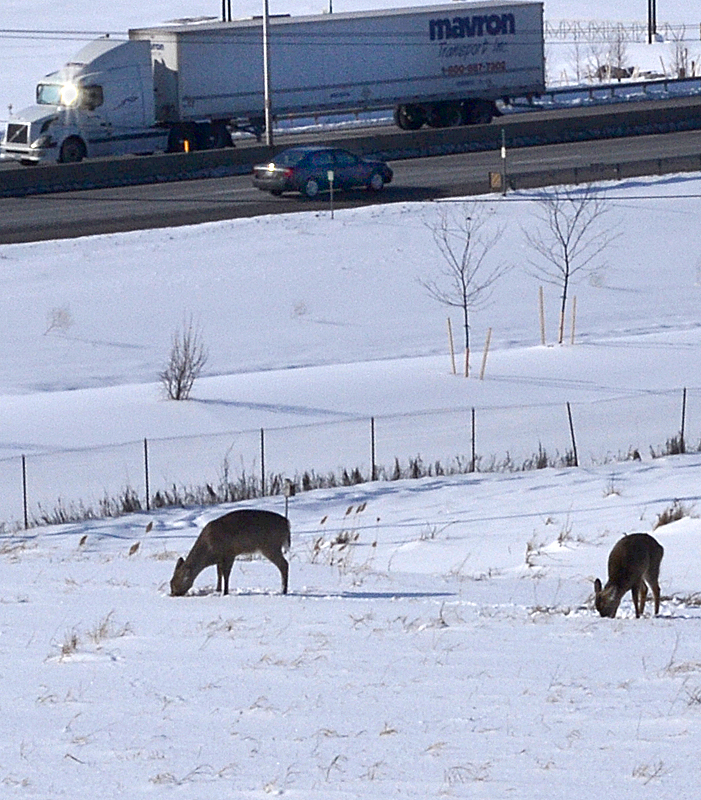 Cornell University struggles with a large number of deer, about 100 deer per square mile. Deer have damaged plants in the teaching and agricultural plots, in the arboretum, in natural areas and in residential areas around the campus. Curtis said they can’t restore wooded areas because the deer eat the maple and oak seedlings. The deer cause other problems for humans. In Tompkins County, where Cornell is located, the number of confirmed cases of Lyme disease, which is carried by deer ticks, has increased 1,000 percent in the last five years. The number of car crashes involving deer has increased. To try to bring down the number of deer, hunters can take two deer a day every day of hunting season in Tompkins County. The habitat in Western New York isn’t very different from Tompkins County, Curtis said. He estimates that areas of Western New York may have 50 or more deer per square mile, perhaps even 100 deer per square mile, and deer numbers can increase rapidly. For our plants, we can try all the tips we’ve talked about for keeping deer away. Choose plants that deer don’t like as much. Try commercial sprays, homemade sprays and urine. Put barriers around your plant like this sunflower or around your garden. 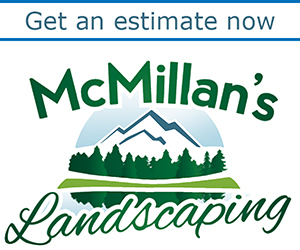 If you have expensive woody ornamentals or have problems throughout the year, you may need to fence in your whole yard, he said, and use a fence that’s at least eight feet high. I recently heard that putting up two sets of fences will keep deer out because deer don’t want to jump into the space between the fences. Alas, like every other tip on keeping deer out of your garden, that one’s not foolproof. Curtis said that at Cornell they have a herd of deer for research penned in with three sets of fences. Each fence is eight feet high and the fences are ten feet apart. While 120 of the deer stayed put, one deer kept jumping the fences and getting out. “A highly motivated deer will do that,” he said. And what about the bigger picture? What can be done to control the population of deer in Western New York? A booklet will be out perhaps as early as next week summarizing seven years of research, Curtis said, and giving community leaders information on what has worked. UPDATE: See that booklet here. It’s called An Integrated Approach for Managing White-Tailed Deer in Suburban Environments: The Cornell University Study. They’ve tried sterilizing the deer. They sterilized 95 percent of the deer in a herd, but that only stabilized the numbers and didn’t decrease the number of deer because of immigration of deer into the area. The researchers tagged and collared deer to track them. They found that the number one cause of mortality was car crashes and the number two cause was hunting. Those two reasons accounted for most of the deaths; only a small number of deer died of cold, disease or predation. Since no one wants cars colliding with deer and hunting isn’t allowed around homes and businesses, how can we control deer in suburban and urban areas? The only thing left is a lethal managed program, or what has been known in Western New York as bait and shoot. A lethal program can reduce deer population by 45 percent, Curtis said. However, it’s expensive and can cost hundreds of dollars per deer, he noted. It’s also very controversial– While some people enjoy deer hunting, others enjoy viewing deer. Yet Curtis said it’s the only way to keep the number of deer in control. 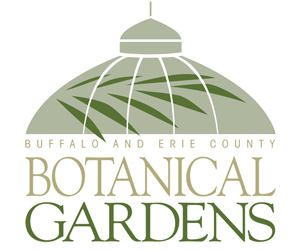 What do you think we should do about deer in our gardens and in Western New York? Please leave a comment. I think bait and shoot is the way to go. The venison can be used in soup kitchens or sold to other consumers and the hides can also be processed and used. There are entirely too many deer. It’s actually frightening to see the herds so close, running down the street or roaming in the yard. you can keep them off your landscape and gardens by using a repellent from a vendor i represent called Deer Defeat: Deer Rabbit and Groundhog repellent. It is all natural, safe for environment, people and animals and is made in NY. for more reasons why it is more efective than competing brands please contact me. I live in Williamsville and one February morning I counted 27 deer in my yard dining on the garden I work so hard to keep nice. We have to do something to control the population growth. The State needs to take responsibility for this problem. How many more people have to die, or become sick, or suffer huge property damages. Not to do so is negligent!! And we need to tell them that! I am close to giving up on gardening and landscaping completely. There is nothing the deer won’t eat and I can’t afford to fence my entire yard. I live in the village of Avon and the deer are everywhere. I’ve used several different deer repellent sprays but they don’t last very long. I live in Williamsville and the numbers have increased enormously in the last ten years. My once beautiful gardens are destroyed. Repellents have stopped working and they consume plants on the low brouse list. I cannot fence my yard. They sleep in my gardens and leave excrement everywhere. I am concerned about tick born diseases and safety. I am hoping we are still continuing bait and shoot, I was on the deer management committee several years ago. This will continue to get worse, what is the answer? I agree that there is very little deer will not eat in lean times,yet people keep planting plants they adore like Taxus and Arborvitae. As a Master Gardener we were trained in making landscapes that deer do not prefer, and building 8 foot fences as noted at Cornell, yet in times of very bad winters, not much keeps those hungry deer away. Deer repellants are helpful, but again, deer can become accustomed to them and also home owners become lax in application. yes, deer can become accustomed to repellents but we have not found that to be the case with Deer Defeat and yes diligence is key with applications, because there are alway new deer as well that may not have come into contat with the repellent. and yes bottom line they will eat anything regardless when it becomes a matter of survival. As Mr. Curtis has said, lethal means are the only way to control the deer population. We need to remove deer from the population. Bait and shoot is very expensive to the taxpayer. Hunting can be the answer. This past year the state finally changed the discharge regulations to differentiate between firearms and archery tackle. While up until this year, there was no difference between a bow and arrow and a gun in the law pertaining to discharge of a “firearm.” While the law still requires a 500-foot setback for firearms, the distance for discharge of a bow has been reduced to 150 feet. That equates to only about 1.6 acres that are off-limits around a house for a bow compared to the 18 acres for a gun. That is more than an order of magnitude reduction in the sphere of influence to discharge a bow around an occupied structure. In addition, the state also has permitted the use of crossbows for hunting. They only require a 250-foot setback for discharge. These requirements are also only for buildings where the discharger does not have the owner’s consent. If the owner(s) within the given distance give permission, discharge is permitted. While the change in discharge laws allows much more opportunity for hunting in suburban areas, there still are a few hurtles. For WNY, the main hurtle is the prohibition of big game hunting in Wildlife Management Unit (WMU) 9C, which encompasses Buffalo and all the first-ring suburbs. Other than NYC, there are no other entire WMUs areas prohibited from big game hunting under state law. The areas around Rochester, Albany, and all of Westchester County are archery only units which allow hunting. The other hurtle is local laws. For example, I grew up in North Tonawanda, which has a substantial deer herd. Although NT is located in WMU 9A, which is legal for big game hunting, there is a city law on the books specifically prohibiting hunting. We need more and more people to write the elected leaders to change a few more laws. When many of these laws were written, they were of no major concern because there were so few deer around, as Mr. Curtis mentioned. We do not have to accept that the deer will take over our gardens. If people voice their concerns, and get organized, we can begin to turn the tide of suburban deer overpopulation. In areas open to hunting, talk to your neighbors, and consider allowing archers in your backyard. If you aren’t in an area open to hunting, write to your elected officials to change the laws. It may take a little effort, but it can be done. Justin, thank you for taking the time to explain the nuances of hunting near homes. My extended family includes a gardener with a deer problem as well as a bow hunter, so this discussion has come up several times. The hunter has emphasized the importance of talking to the neighbors. I am glad to hear that archery is being allowed in more areas. If it will be allowed in NT, perhaps Amherst and Buffalo (obviously in limited areas) will follow. This would be preferable to bait and shoot.